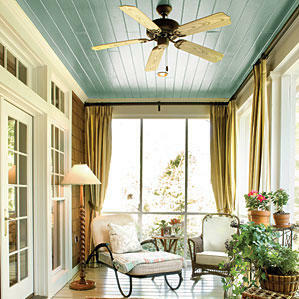 There is no denying that a blue porch ceiling is charming. There is something just so ahhh, calming about sitting on a porch with a cold glass of anything on a warm day. If the ceiling is blue the owner may have thought it would be fun to reflect the sky or to emulate other porches they have seen, or they may have a fond memory of their grandmother’s porch. But would it surprise you to learn that there are varied myths on the positive attributes of blue ceilings? These myths vary from practical to spiritual. Sitting on the porch was an evening past time for most areas of the US for centuries, that is until air conditioning and TV became the norm for every household. A cheery blue was thought to reflect the waning sun while providing a cooling effect to the porch. Thus, a blue porch ceiling helped to extend the evening hours, as one chatted with the neighbors or with family for entertainment, while waiting for the house to cool down from the heat of the day. 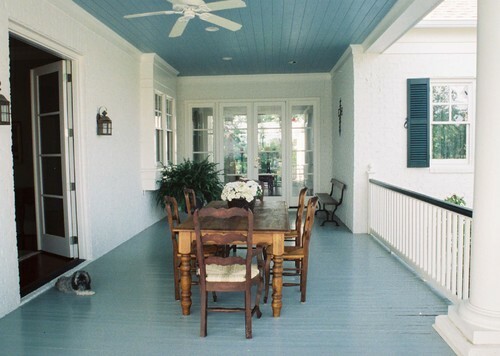 But my favorite reason comes from the low country tradition of painting a porch ceiling a color known as ‘Haint Blue.’ The southern origin actually derives from the Gullah/Geechee people whose homes are in the coastal areas stretching from South Carolina to Florida and especially the Sea Island areas. They are descendants from slaves most likely from the Sierra Leone/Angola/West Africa region based on linguistic and cultural studies of the last 50 years or so. Isolated and somewhat homogeneous of origin, they managed to retain many elements of their African heritage and traditions. One cultural/spiritual practice is to prevent unwelcome spirits or ‘haints’ from entering the home by several means, including the blue paint. What is interesting is that Haint Blue is actually not a particular shade of blue, although most experts seem to agree it is in the blue-green family. 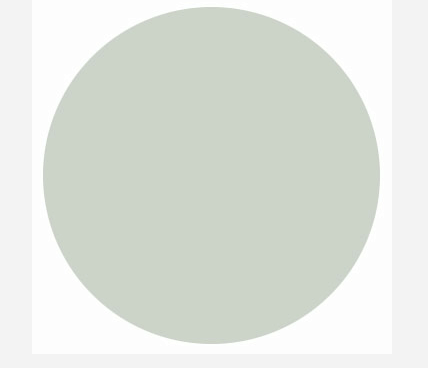 Haint Blue was usually based on a milk paint recipe that included lime and bluish pigments that would resemble water. The idea is that spirits could not cross water, so painting a porch ceiling a watery blue would confuse the spirit and prevent it from entering the house. 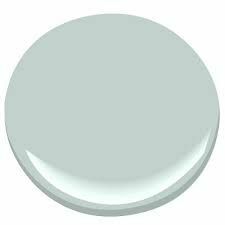 Not wanting to risk anything, many southerners kept this in mind and many fancy houses in Charleston and Savannah, as well as cottages throughout the low country, sported a Haint Blue ceiling. Although, it is probable that for most southern homes today the blue continues to be favored as more of tradition and aesthetic than any other consideration. If you search for Haint Blue you will find numerous articles on this subject and if you search for this color in Benjamin Moore, Sherwin Williams, Behr, Duron etc paint choices you will be offered a number of colors that will be suitable for keeping away whatever spirits you wish to thwart. While I do not have a porch on this house, I do have a front door portico that is in need of some love. When we do that update I plan to choose one of these colors. Sure hope no Haints come calling between now and then! This was so well-researched and interesting to read!! Thank you for sharing & enlightening me.